The finale of “The Voice of China” is broadcast live from the Beijing Olympic Centre (The Bird's Nest), using Jünger Audio technology. “The Voice of China” recently completed its fourth series on Zhejiang Satellite TV as one of the country’s most popular amateur talent television shows. The audio production team behind the Voice of China has been using Jünger Audio loudness control and audio processing equipment to ensure the quality of broadcasts transmitted in 5.1 surround sound. Based on the same concept as NBC’s “The Voice,” the show features four judges/coaches who used blind auditions to identify teams of singers they wanted to work with during the series. 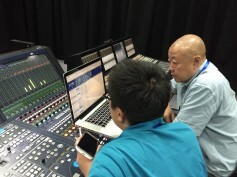 Lou Wei, chief audio engineer for the show's 5.1 surround sound production, is from CTPC Studio, a division of CCTV. Working on behalf of Dolby China (in tandem with the production company responsible for The Voice of China), Wei has been in charge of acquiring and processing 5.1 surround sound and broadcasting it since the series’ first season. In China, the format most widely used for surround sound production is Dolby E. However, Dolby Lab’s decision to stop making hardware products to monitor this format left a gap in the market that Jünger Audio—with the backing of Dolby—helped to fill. Jünger’s D*AP8 Codec Edition units now incorporate a Dolby decoder as a standard feature, along with a choice of optional encoders, so that broadcast engineers in post-production, DVD and DTV facilities can check the quality of Dolby E, Dolby Digital or Dolby Digital-encoded audio prior to transmission. Zhang Yan, Technical Director of Dolby International Services (Beijing) Co., Ltd, said that the D*AP8 MAP Monitoring Processors matched Dolby E productions very well because they support HDSDI embedding and de-embedding, as well as Dolby codecs. This was important because most of the video equipment that works with Dolby E also supports HD-SDI, rather than the AES interface. Lou Wei (right), chief audio engineer, has been in charge of acquiring and processing 5.1 surround sound and broadcasting it since the series’ first season. Yan also said that Jünger Audio’s products provided various interface options, flexible routing and comprehensive features. This allowed them to customize the units to fit different requirements. For The Voice of China, Yan and Wei are also working with two of Jünger Audio’s D*AP8 TAP EDITION audio processors, which are installed in the transmission chain and used for Dolby E encoding. They also chose a pair of D*AP8 MAP EDITION audio devices that incorporate a comprehensive Dolby toolkit (including metadata emulation), along with full loudness metering and logging capabilities. These multichannel monitoring units were installed in the program chain and used for Dolby decoding and metadata emulation. A third D*AP8 MAP was used for Dolby metadata emulation during the music pre-mix sessions, and a 2-channel D*AP4 VAP Voice Audio Processor was used for all vocal balancing and processing, including commentary from the judges and hosts and the singers' speeches. Although the finale of “The Voice of China” is broadcast live from the Beijing Olympic Centre (The Bird's Nest), all earlier episodes are pre-recorded and post produced by Zhejiang TV’s production staff in conjunction with Lou and his team. A Jünger Audio Level Magic Plug-In was used at this stage to guarantee overall audio quality and ensure consistent loudness values across the entire 5.1 audio chain. Wu Xiao Dong, Director of the Audio Department at the Zhejiang TV Group Production Centre, adds that there is currently great demand for 5.1 surround sound from the ZJTV Group and that Jünger Audio equipment is proving valuable in helping to meet this demand.